The last songs are very good and “intense” enough for my taste. The Suite is a sort of division line of this new Arachnes work. 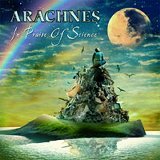 Arachnes are at their 5th studio album and are one of the best Prog Metal Italian bands. They are strongly influenced by the good old Progressive Rock a là Emerson, Lake and Palmer and by the Prog Metal of the last decades, and always manage to shine in the Italian Metal landscape. This new album, “In Praise of Science”, seems to fulfill again some of the promises this technical band always implies. The album opens with an “Ouverture” with strong classical reminiscences in which the very good keyboards show what the man can do. An aggressive piano composition, in which the influences of Keith Emerson can easily be discerned, this song is a good prelude to the album, and introduces the theme that we will listen in the second song, “Gothic Description”. The voice Enzo Caruso is present with authority although not resorting to high pitched screams, but basing its strength mainly on interpretation – a good Prog feature. Drums and bass march together with almost a power tempo, with great weavings of synths and good rhythm and solo guitars. This song is extremely cadenced, and all in all it flows away easily to the listener’s ears. “Dark Side of my Mind” is a strange song with ominous riffs coupled with clean arpeggios of guitars and a melodic lyric line. Interesting although in my opinion not the best song in this album. Synth arpeggios with a chorus/phased guitar open the following track, “I’m closing my Eyes”. Decidedly heavy, acid, aggressive and powerful, with harmonic riffs of guitar, bass and keys, and a nice vocal line, this song features also quick synth and lead guitar soloes that closely remember bands such as Symphony X or Dream Theater. And we come to the suite of the album “Mediterranean Suite”. Beautiful, evocative riffs of effect-rich guitar and powerful keyboard pads give an eerie feeling to this precious song. Soon the suite opens up with electric piano arpeggios supported by strings and orchestra percussions, giving way to an even more ominous section with ghostly vocals and a very good heavy rhythmic section, that ends with a solo series returning to the main theme for the closing section. "Schizophrenia", the title notwithstanding is a sweet ballad, wth moving piano arpeggio with a carpet of strings, with a sad mood and the voice of Caruso getting to a very high pitch, good vibrato and interpretation crowing a great song that culminates with a heart-slicing guitar solo. Beautiful, moving, intense. On a complete different shore is the following “Nightmare”, Symphonic Prog metal song with evil and wicked riffs rolling over synth arpeggios and a cruel vocal line. Quick guitar soloes, thunderous bass and good drumming create what I find the best song of the album. To this follows a splendid hammond organ arpeggio that clearly recalls Keith Emerson again, and opens the song “Knowledge”, that flows with a typical Prog metal style, slashing vocals and hammering rhythm with a hypnotic bass. As often happens… the best parts of an album are in the final section! And (what a surprise…) Arachnes decided to include an Emerson, Lake and Palmer cover in their album. This time it is “Blues Variations”, from the excellent ELP live album “Pictures at an Exhibition”. As already happened with “Eruption”, the interpretation of this cover is very good, intense, faithful and yet innovative. My judgement on this album is mixed… on one side the last songs are very good and “intense” enough for my taste, on the other side the first songs are a bit “weak”. The Suite is a sort of division line of this new Arachnes work. Technically speaking… well, what can be said about one of the most technical Italian metal bands? Excellent recording, excellent performance, end with very little of the bitter coldness that characterises technical and yet “empty” works such as Dream Theater or Vitali Kuprij. From a more emotional point of view, and on the light of the previous albums I expected something more “metal” from Arachnes; instead some songs are a bit on the slow side. Anyway, this is a good album from a good Italian band that I always listen with great pleasure and… by the way, whoever can play ELP covers like that must be at least listened a dozen of times. Good work, Arachnes!